Your service manager will love the visibility. Your techs will not miss their clipboard. View all your tech schedules at once, or filter to focus on a specific truck or tech. Use the calendar view or list view to get visibility to your tech's schedules. Use the route-optimization feature to reduce windshield time and keep your techs moving! Techs then move from job to job using Google Maps, helping them avoid traffic, accidents and you increase revenue per route. Your service techs can use the clock in / clock out feature so that you know where they are, and how long each job is taking. Detailed application information and user tips available within the application. Look professional in front of your customers by giving techs the information on the last 5 service calls. Tired of having to call a customer back to verify information? Streamline your process with customizable customer "interviews". 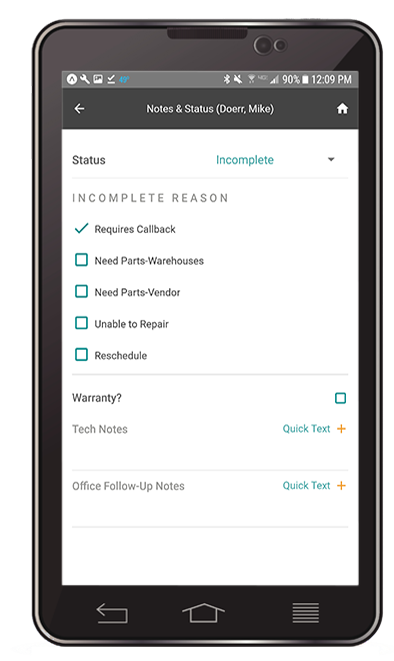 Service techs love to use the voice-to-text feature on their phones to quickly capture notes. Standard typing works too! Tell your customers you are on the way, or have arrived with just a click of a button. 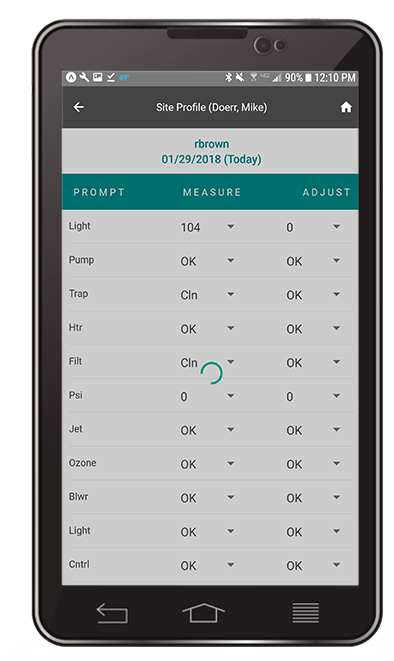 New look and feel makes Evosus Mobile easier on the eyes and easier to read in the field. Most functions are faster, and can be done with one hand. Pull up the customer’s purchasing history right from the application. Allows tech to easily add their most commonly used items without scanning or typing. Add new customer equipment information, to their profile, while you’re on site. No more paper! Capture data and store it in the customer's account for reference on future visits. Techs love using their mobile phone to scan product barcodes and eliminate typing. A huge time saver! Seeing is believing. Taking pictures is important for equipment damage, unexpected situations or when a job looks so good, it belongs on a brochure. Syncs up with the customer's account for future reference. Visibility of the last five site profile visits so techs can compare measurements and make adjustments. Ever have a walk-up lead from a neighbor? Now you can collect their information (including their product interest). No more scrambling for scrap paper and hoping it gets back to the office! Real time view of stock availability and Inventory price. Always know how long you’ve been at the customer location. Quickly access Customer Profile notes for each customer on your schedule. In about an hour, we can walk you through a live, personalized demo that gives you an opportunity to ask questions and address your organization's specific needs.